The history of the Hungarian workers' revolution against the Communist dictatorship. A general strike was declared, and workers' councils sprung up across the country. In cities the workers armed themselves and fraternised with the troops, but were eventually crushed by Soviet tanks. It is not out of love for nostalgia that we are commemorating the 1956 Hungarian uprising: Hungary '56 was a prime example of the working class itself reaching for power. Doubly significant, it took place in one of the mythical 'workers' states'. It showed for many, throughout the world, a new alternative to capitalism and Soviet communism - read state capitalism - and it galvanised movements towards genuine revolutionary politics. When the Soviet Army swept into Eastern Europe towards the end of the Second World War, they did not in fact liberate workers and peasants. The same system as before continued to exist, with Stalin giving backing to reactionary governments. Between 1919 and the end of the Second World War Hungarians suffered the fascist regime of Admiral Horthy, which murdered thousands and deported over 400,000 Jews to the Nazi concentration camps. In 1944 the country was 'liberated' by the Soviet army and a new Hungarian government installed, headed by Commander-in-Chief of the Hungarian Army, Bela Miklos - a man decorated with the Iron Cross by Adolf Hitler. This new government again supported Horthy as ruler of Hungary. The Communist Party soon began to infiltrate the government, taking with it the Ministry of the Interior and control of Hungary's secret police, the AVO. The AVO was feared and hated by the Hungarian working class because of their record of torture and murder and because of the privileged position they held in Hungarian society, receiving between three and twelve times the average workers’ pay. In the meantime the Soviet Army took an immense amount of plunder back with them from Hungary and requisitioned huge amounts of grain, meat, vegetables and dairy products. They loaded an immense reparations demand on Hungary which meant the Hungarian working class had to pay, in food shortages and low wages. The Kremlin ended up cancelling half of the reparations still due in 1948 because they feared an uprising. Moscow continued to exploit Hungary in other ways: they sold to Hungary at above world prices and bought its exports at well below world prices. By 1950, Hungary was thoroughly integrated into the political and economic system of the USSR, with the state-decreed collectivisation of agriculture and nationalisation of industry. But ill feeling and unrest was beginning to grow: workers reacted to the newly introduced system with go-slows, poor quality work and absenteeism. Disaffection spread rapidly. Dissent within the Communist Party also grew, and purges began. In Hungary, 483,000 Party members were expelled and hundreds executed. Joseph Stalin died on March 6, 1953. The hopes of workers rose: they thought there was a chance of ending the dictatorship over the proletariat. Later that year, there were risings in Czechoslovakia and East Germany, which were quickly suppressed. In the USSR a strike movement began on July 20 involving 250,000 slaves in the forced labour camps. The Stalinists responded by executing 120. This upsurge among the workers of the Iron Curtain countries forced the Party bosses to take a softer line. At the 20th Congress of the Russian Communist Party in February 1956, Khruschev began to denounce Stalin. This was followed almost immediately by the Poznan revolt in Poland. Polish tanks crushed the revolt. Similar events began to unfold in Hungary. The Petofi Circle was formed in April 1956 by Young Communists: it was named after Sander Petofi, the famous national poet who had fought for Hungarian freedom in 1848 against the Austrian Empire, and was backed by the Writers Union. Soon thousands were attending meetings of the Circle, and the articles that they wrote for their literary gazette began to circulate among workers. By July, discussions on conditions in Hungary and in particular the AVO had multiplied. Some speakers at Circle meetings even demanded the resignation of Imre Nagy, the Party head. This critical spirit spread to the workers, who began to demand more control over 'their' factories. They wanted trade union democracy, workers participation and consultation of management with the union committee on wages and welfare. The Petofi Circle supported these demands. They were put to the government in a request to hand over the factory administration to the workers. While Gero, First Secretary of the Hungarian Communist Party, was meeting Tito in Belgrade, the Petofi Circle decided to call for a demonstration in solidarity with Polish workers who were on trial as a result of the Poznan revolt. The authorities, who wanted to avoid confrontation, allowed the protest. The Petofi Circle and other discussion groups met, as well as dissident student organisations including the official Communist Party youth group and decided to march on October 23 to the statue of Josef Bern in Budapest, a Pole who had fought with the Hungarians against the Austrian monarchy in the 1848-9 revolution. The ruling party panicked. Their Minister of the Interior banned the march, but because it was already forming in parts of the city, they lifted the ban. The demonstration was mostly young people, with a small number of workers downing tools to join in. Outside the Parliament buildings they called for Imre Nagy, who had been expelled from the party for 'deviationism'. Nagy had faithfully carried out all of Stalin's policies. When, however, he was replaced by arch-Stalinist Rakosi, he had won much misplaced sympathy. By now, Gero was broadcasting over the radio and denouncing the demonstrators as counter-revolutionary. As the day turned to evening, 100,000 people gathered. The crowd decided to march on the radio station to request their demands be broadcast, tearing down a giant statue of Stalin as they went. The radio building was heavily guarded by AVO, but eventually a delegation was let into the building. But two hours passed and still no sign of the delegation. The crowd grew extremely restless and began to demand that the delegation be released. Suddenly the crowd leapt forward. The AVO men opened fire with machine-guns on the unarmed mass. Many fell but the crowd continued to advance and overwhelmed the policemen, taking their weapons to fire at the radio buildings. News of the events in Sandor Street spread fast. Workers returned to arms factories where they worked and with the night shift workers loaded lorries with arms. These were taken to Sandor Street and distributed. In the surrounding streets workers and students began to set up road blocks. Various manoeuvres were meanwhile taking place inside the Government and the Party. Gero arranged that Nagy should replace the colourless Hegedus as Premier. At 8am Wednesday morning it was announced that the Government had asked for Russian Army units stationed in Hungary to help 'restore order'. Workers and Students in Budapest set up a revolutionary council - not seen since the 1918 Revolution - early on Wednesday morning. A pitched battle swarmed around the radio building, while manoeuvring continued inside the Communist Party. Gero was replaced as First Secretary by Janos Kadar. Kadar came from the working class. He had been a 'Titoist' and had been imprisoned and tortured horribly. The bureaucrats thought this a fine move - a perfect sop to the rising discontent. Nagy broadcast at 9am calling for the laying down of arms and promising widespread democratisation. In response the Revolutionary Council of Workers and Students issued leaflets demanding a general strike. Russian tanks rolled into the city the same day and fierce fighting broke out. Barricades were built from barrels. Later these were strengthened with railway coaches and weapons from a goods yard. The workers and students used Molotov cocktails, arms they had captured, and even a small field gun with which they bombarded the tanks. The strike called by the Revolutionary Council of Workers and Students spread through the whole of Budapest and out into the main industrial towns - Miskolc, Gyor, Szolnoc, Pecs, Debrecen. Revolutionary committees and councils were set up throughout Hungary. Everywhere workers armed themselves and in some towns, radio stations broadcast messages against the Stalinists, telling the people not to be fooled by the Government into surrendering their arms. Many councils quickly issued programmes calling for political and civil liberty, the withdrawal of Russian troops, workers management of the workplace and of industry, the banning of the AVO and freedom for trade unionists and parties. Some of the programmes wanted the return of 'parliamentary democracy' while others gave support to Nagy. Peasants and farm workers organised deliveries of food to the workers in the cities. They drove out the kolkhoz (State farm) managers. In some areas they redistributed land, while in others they kept the collectives going under their own management. The Observer said: 'Although the general strike is in being and there is no centrally organised industry, the workers are nevertheless taking it upon themselves to keep essential services going for purposes which they determine and support. Workers councils in industrial districts have undertaken the distribution of essential goods and food to the population, in order to keep them alive... It is self help in a setting of Anarchy. " Fighting between the insurgents and the Russian Army increased in intensity. On Saturday night, Budapest prison was captured and all the political prisoners were released. The people soon heard all the stories of terrible conditions, of torture and beatings that had been inflicted. Budapest Radio continued to call for a ceasefire, promising immediate wage increases, negotiations for Russian-Hungarian political and economic equality. Nagy attempted to calm the situation down. He promised that the AVO would be disbanded, and that the Government would be re-organised. Though several groups of insurgents had surrendered due to lack of ammo, the fighting continued around Szena Square and the Killian Barracks. A meeting of Council delegates at Gyor reaffirmed their demands to Nagy. On Tuesday morning, Budapest Radio announced the withdrawal of the Russian troops. Nagy asked for calm from the people while this withdrawal took place, and for a return to work. 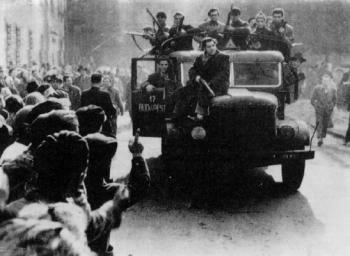 The Red Army began to withdraw from Budapest that afternoon. The workers in Budapest and in other parts of the country remained armed and ready. It was fortunate they maintained their vigilance because the Russians had only withdrawn to surround the capital with a ring of tanks. From the north east, Russian reinforcements entered the country. Local councils sent news, and Nagy was warned that unless Red Army troops withdrew, the Councils would attempt to stop them. The strike throughout industry would not end until troops were withdrawn. By November 3rd, the Red Army detachments had occupied most strategic points in the country, apart from the cities controlled by insurgents. Members of the Nagy government assured the people that Russia would not attack again. The working class did not believe their assurances - with good reason. The Russians opened fire with tanks and artillery on all major cities the next morning. Russian tanks trundled into Budapest, firing conventional and incendiary shells. Janos Kadar, a member of the Nagy government, now formed a 'Workers and Peasants Government.' Nagy had already sought refuge in the Yugoslav Embassy with fifteen other officials and their families. This new government asked the Russian government to help them in liquidating the ‘counter-revolutionary’ forces. The fighting went on for over a week. Over the radio Moscow had announced the complete crushing of the 'counter-revolution' by midday of November 4. Organised resistance of the Hungarian working class nevertheless continued until November 14th. As the war ended the AVO came out the holes they had been hiding in. They began to hang insurgents in groups on the bridges over the Danube and in the streets. Fighting continued in country areas into 1957, but it was sporadic and isolated. Although many began to return to work, striking continued in most industries. Kadar worked to undermine the power of the Worker's Councils. He arrested a few members of the Council's Action Committees. This failed to intimidate. Next he promised the abolition of the AVO, the withdrawal of Russian troops, and a purge of Stalinists from the Party. Some workers believed this and returned to work. But the strike continued in many areas and in many industries. On November 16, Kadar was forced to start talks with delegates from the Councils. They demanded that a National Worker's Council be set up, which Kadar rejected, saying there was already a "workers government." However, he was forced to agree to the recognition of individual councils and the setting up of a factory militia. Kadar said that if work resumed, he would negotiate for a withdrawal of the Russian Army. The delegates asked that he put this in writing, which he refused. Kadar tried other methods. He used the Red Army to stop food deliveries to the towns by peasants. He started issuing ration cards - but only to workers who reported for work. Still the strike continued. Kadar and his Russian masters were getting impatient. Already disaffection was spreading inside the Red Army. A few joined the guerillas, whilst many more had to be disarmed and sent back home because they refused to carry out orders. In response, the Hungarian government tried yet another tactic. Arrests of workers' delegates began. Many council delegates were rounded up, as well as delegates of student bodies. Many came forward to take their place. When the State realised this, they began imprisoning the rank and file as well. Over the next few months, resistance continued against the onslaught of the 'Workers Government'. Mass demonstrations continued, and workers fought the AVO and the soldiers when they came to arrest their delegates. Through 1957, the arrests, imprisonments and executions continued. Those Council members not arrested began to resign, with the last Council remnants being quashed by November 17th that year. There are no official figures for how many people died in Hungary in 56-57. Between 20 and 50,000 Hungarians and 3 to 7,000 Russians is the estimate. The number of wounded was much higher, and over 100,000 fled across the border. Strikes and demonstrations continued into 1959, and the struggle for workers’ power continues to this day.